какова цена биткоин 10 сентября? Выиграть $150! Ежедневно чат лотереи @Rollin! Получите бесплатную лотерейные билеты прямо сейчас! Giveaway: Roll number 2 and win 100,000 satoshis! Total lottery pot ~ 230 mB - ~ 6 hours left for the draw. Your the Get (the Free) ticket example (s) in the the chat and / or in the Lottery thread. You CAN the join with a minimum of 1 mB! всем привет! я на роллине с середины 2015 года... проект очень добротный! всем рекомендую!!! если есть вопросы помогу! Не знаю англиша проясните пожалуйта на русском что тут и как ?! есть много плюшек: чатигры, летереи, кран (чем выше ваш уровень, тем больше даст) и конкурсы админ проводит! и админ кстати очень общительный! Rollin получает DDoS-атаки и чат в настоящее время отсутствует, мы работаем над этим. Периодически сервис устраивает РОЗЫГРЫШИ в facebook'е. Вам необходимо предсказать курс биткоина к доллару на 23 октября 2016 года. Сделать это нужно до 15 октября 2016 года. Также следует поделиться своим постом. Опубликовавший наиболее близкий прогноз к фактическому курсу получит $50. Draw: September 1, 2016. Winner: Tryme4pkr won 8 mBTC. Draw: September 4, 2016. Winner: bankk won 166 mBTC with a Free Lottery Ticket. Draw: September 5, 2016. Winner: natsag3 won 18 mBTC. Draw: September 6, 2016. Winner: Masikyr won 26 mBTC. Draw: September 7, 2016. Winner: angayan17 won 85 mBTC. Draw: September 8, 2016. Winner: CoolDad won 101 mBTC. Draw: September 11, 2016. Winner: Masikyr won 69 mBTC. Draw: September 12, 2016. Winner: Masikyr won 26 mBTC. Draw: September 13, 2016. Winner: psonowa won 20 mBTC with a Free Lottery Ticket. Draw: September 14, 2016. Winner: Tryme4pkr won 17 mBTC. Draw: September 15, 2016. Winner: brexit won 40 mBTC. Draw: September 18, 2016. Winner: CoolDad won 147 mBTC. Draw: September 19, 2016. Winner: boxxob won 246 mBTC. Draw: September 20, 2016. Winner: shanem won 19 mBTC with a Free Lottery Ticket. Draw: September 21, 2016. 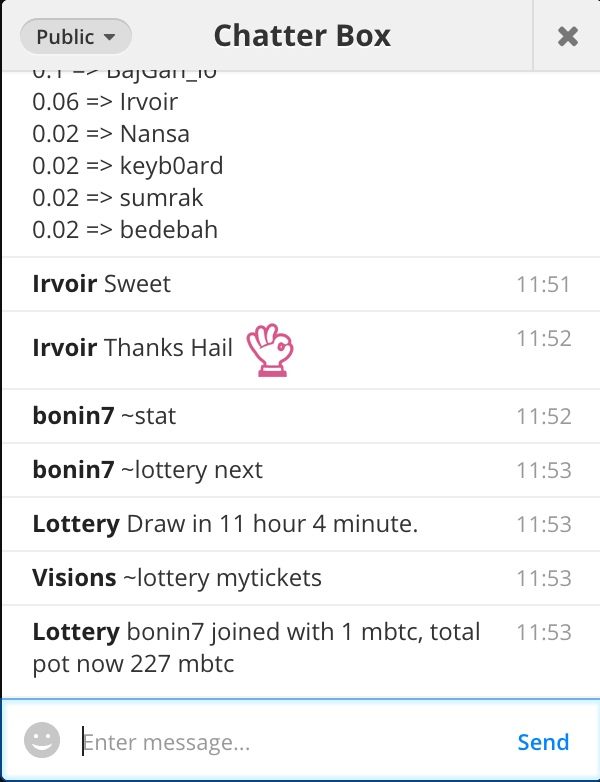 Winner: PvP won 5 mBTC with a Free Lottery Ticket. Draw: September 22, 2016. Winner: CASIO won 18 mBTC with a Free Lottery Ticket. Draw: September 25, 2016. Winner: james1 won 33 mBTC with a Free Lottery Ticket. Draw: September 26, 2016. Winner: Visions won 114 mBTC. Draw: September 27, 2016. Winner: SimpleRed7 won 15 mBTC with a Free Lottery Ticket (by mistake!) and Cannabis won 15 mBTC. Read the full story. Draw: September 28, 2016. Winner: Laruku won 150 mBTC. Draw: September 29, 2016. Winner: Tryme4pkr won 23 mBTC. Draw: October 2, 2016. Winner: Pool won 325 mBTC. Draw: October 3, 2016. Winner: Ton won 164 mBTC. Draw: October 4, 2016. Winner: katerniko1 won 9 mBTC with a Free Lottery Ticket. Draw: October 5, 2016. Winner: NoBalance won 5 mBTC. Draw: October 6, 2016. Winner: sammyG won 17 mBTC. Draw: October 9, 2016. Winner: Daily_GoaL won 250 mBTC. Draw: October 25, 2016. Winner: Barcode won 54 mBTC with a Free Lottery Ticket. Draw: October 26, 2016. Winner: Wilhelm won 12 mBTC. Draw: October 27, 2016. Winner: carmen won 25 mBTC. Next Draw: October 30, 2016. Winner: to be announced. Конкурс прогнозирования [NEW] FB, что ваш BTC прогноз на 11 ноября 2016 года? Лотерея выходные только началась; Получить билеты! Предыдущий приз лотереи выходные было 250 Мб! [Last Day] WIN $50 by predicting the BTC price! Draw: November 2, 2016. Winner: Humbertin19_ won 29 mBTC. Draw: October 30, 2016. Winner: natsag3 won 44 mBTC with a Free Lottery Ticket. Это наша девушка! Поздравляю от души!!! Draw: October 31, 2016. Winner: se7en8891 won 20 mBTC. Draw: November 1, 2016. Winner: Tryme4pkr won 11 mBTC. Next Draw: November 3, 2016. Winner: to be announced. Новое Draw: November 3, 2016. Winner: angayan17 won 94 mBTC. Draw: November 6, 2016. Winner: SergiuS won 101 mBTC with a Free Lottery Ticket. Тоже наш человек! Поздравляю от души!!! Draw: November 7, 2016. Winner: psonowa won 10 mBTC. Draw: November 8, 2016. Winner: bankk won 9 mBTC with a Free Lottery Ticket. Next Draw: November 9, 2016. Winner: to be announced.